The President did what the President does; I can live with it. Fr. Jenkins' remarks? Profoundly disheartening. The man cites Ex Corde Ecclesiae and Benedict XVI in passages about courageous Christian witness and contorts them into a defense of rank moral cowardice and conformity. 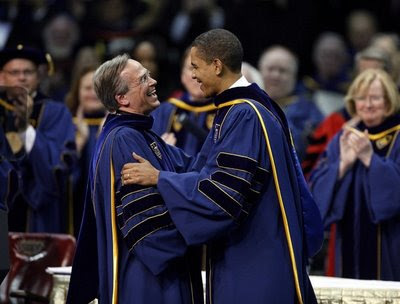 And he tells the Notre Dame grads the world needs this witness, and they're uniquely qualified to give it. The latter part I fear may be true. If you've got the time, the best piece on the Notre Dame thingy is Jody Bottum's from First Things. What the press seems to have missed is that serious Catholics are not mad at Obama in this instance, they're mad at Notre Dame. The Obama administration is full of very smart political operators. Reading last November’s electoral entrails, they’ve sensed the possibility of driving a wedge through the Catholic community in America, dividing Catholics from their bishops and thus securing the majority Catholic vote Obama received in 2008. And they’ve shrewdly judged that the soft underbelly of Catholic resistance to the Obama administration’s radical agenda on the life issues is composed of Catholic intellectuals, their prestige institutions (like Notre Dame and Georgetown), and their opinion journals—the very people and opinion centers who claimed last year that Obama was the true pro-life candidate. It’s a clever move on the political chessboard, and barring extraordinary actions from the bishops, it will likely meet with considerable success. Not since the local lands were wrested from the Indians has a white father spoken with such forked tongue.